food boxes for 65 Air Force families in need. What a year! Our small club helped hundreds of families in many ways, here and in Senegal. In July we bought and filled the backpacks of first graders at Bishop School with all the required supplies. This is a project that we've done for more than 10 years. Each year, it seems, the backpacks and their contents get more technological and more expensive. Families in Englewood really need our help. Members Vee Sabel and Dawn Shepherd did the shopping, assembling and delivering. In August our member Judy Beggs was in Gueoul, Senegal, carrying out two grant projects -- a district grant secured by our club with contributing partner clubs of Highlands Ranch, Wheat Ridge and DTC. This project was to teach English as a Second Language to girls who are part of a Friends of Gueoul program, founded and directed by Judy, and others in the community. The second, smaller grant was from the Society of Professional Journalists Colorado Pro Chapter to obtain software and produce an online news report about happenings in Gueoul. Shy girls found the courage to ask strangers questions about soccer and changes in their community. The grant was secured by our member Bob Burdick. September rolled around, and we were all about wine and raising money. We held the 2nd Annual Harvest Wine-tasting fund-raiser at The Guild in Englewood. President Ed Koerperich and his family get the lion's share of credit. We raised about $10,000 mostly from the auction that featured vacation getaways to Provence, Santa Barbara and Winter Park. We also participated in a golf tournament-fund-raiser organized by the United Service Clubs of Englewood, of which we and the Greater Englewood Chamber of Commerce are members. That brought us about $1,800 for our charitable work. In October and November it was all hands on deck for our program helping Air Force families in need with Thanksgiving food and holiday gifts. The families were screened for need by commanders or designees at Peterson and Schriever Air Force Bases and at the Air Force Academy. We filled huge carts at Costco with turkeys and all the fixings for Thanksgiving dinner for families of four. And we filled wish lists of toys and clothing for 65 families that included more than 100 children. Whew! This was a $15,000 project, with a matching grant from the district and some financial and volunteer support from the North Colorado Springs Rotary, and East Colorado Springs Rotary and Castle Rock High Noon -- all ably led by our club President Ed Koerperich. Many members shopped and helped on the distribution day. We also rang the bell for the Salvation Army, a club tradition of many years. If it's December, it's another party with Santa for Head Start kids at the Center for Early Childhood Education in Littleton. With a grant from the Englewood Walmart and funds from our foundation, we invited 65 kids for lunch, a spot on Santa's knee and a bag full of winter clothes and toys. This is Dr. Frank Sargent's project, possibly the 20th year. Special thanks to Vee and John Sabel, as well as volunteer shoppers and wrappers. January and February are usually quiet times for our club. We did get creative, though. We selected not just one president for the next Rotary year, but three. We're calling it the Team of 3. Linda Spear, Gary Sears and Susan VanDyke each will take a four-month tour of duty. Because of software issues in Rotary, Linda Spear will be the name on Rotary records, but in our reality, the three will have equal responsibility and authority. Every month we enjoy three lunch meetings with fabulous speakers. On the fourth Wednesday we dine out! We call this "happy hour," but it has morphed into dinner. We've been to Zane's, Bar Louie, One Barrel, Volcano. . . . We usually have 15-20 participants -- wives, husbands, guests all invited. In March and April we are interviewing seventh graders and high school sophomores and juniors for the fabulous Rotary camps known as the Rotary Youth Leadership Awards. We expect to send four kids this summer -- at no cost to the families. Every RYLArian returns and says the experience change his or her life. About this time of year we also give a Literacy Award to a District 5450 club that has conducted a fabulous project such as reading to kids, supplying electronic tablets, giving dictionaries, mentoring immigrant families. For spring, we hope to recruit new members and decide on new projects. The Team of 3 has said they wish to focus our work primarily on Englewood. 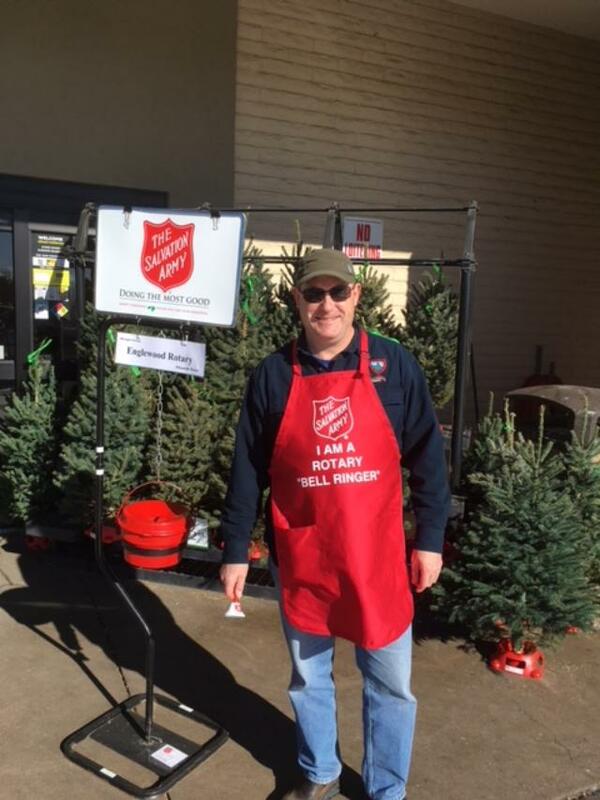 How long have we been ringing the bell for the Salvation Army? Maybe 20 years? This year we had lots of volunteers filling two Saturdays. We hope our friendly faces encouraged shoppers at the King Soopers at Belleview and Yosemite to give generously. It's a new Rotary year! We had a Changing of the Guard party, celebrating Patty Burnett's two years as president of our wonderful club and Ed Koerperich's ascent to the top. Our club enjoys a good party! We meet three Wednesdays a month at the Brookdale Meridian Englewood for lunch, and then on the fourth Wednesday we do an evening happy hour at rotating restaurants. We socialize well. Brayden Espinosa, Sofia Montoya, Lauryn Williams, Paige Langley, Alexandra Foster, Isabel Montanez and Emma Hubbard. We are very proud of these young people. RYLA: Our club is a big believer in the Rotary Youth Leadership Awards, which is a long name for a fabulous opportunity for middle school and high school students. We award them five days at an extraordinary camp where they learn about teamwork, about civic responsibility, about our core Rotary ethic, the Four-Way Test. This summer we have three students will be attending: Logan Hilzer, Cherry Creek High School; Anina Qazar, Campus Middle School, and Rocky Grajek from Merrill Middle School. Every student who attends returns to say, "It changed my life." So we look forward to hearing from these young people later this summer. College and trade school scholarships: Our club has a history of supporting the graduates of Englewood High School and Colorado's Finest School of Choice. We have awarded at least $90,000 in scholarships over the last 10 years. We just selected a new group: Jade Barela, Alonzo Cobos, Manuela Berisa, Jakob Garcia, Isabel Montanez, Tatum Newman and Lauryn Williams. They each will receive $1,000 scholarships sent to their schools of choice. Congratulations, scholars! Our District Governor Abbas Rajabi reminds us that Rotary began in 1905 as a networking group, long before that term arose. Chicago attorney Paul Harris created a club in which professionals with diverse backgrounds could exchange ideas, form meaningful, lifelong friendships and give back to their communities. Rotary's name came from the group's early practice of rotating meetings among the offices of its members. That's Rotary today, as well. Somehow, along our history, the networking function got a bad name in Rotary, and we were told, It's NOT a networking group. It's Service, Service, Service Above Self. But the reality was that my dentist and my insurance agent, and, time was, my travel agent were all Rotarians. It's only natural that you seek the professional help of people you know and trust through Rotary. District Govenor Rajabi encourages us to deepen our networking connections. So I am planning a program in March in which we will have a structured networking exercise. Now, a great many of us are retired, so you won't be needing the services of, say, a retired urologist! But this is also a way for us to know each other better. Some of our best programs have been from our own members. Susan on recycling. Peter on his amazing life all over the world. And next week, we'll have Diane Arave, who has had a career in health education, advising us on how to live more healthily. So, this is the bottom line for this story: Networking is good. Let's do it! That's Ed in the back of a pickup, loading food purchased at Costco. We filled the pickup and three SUVs, and wrote a check for about $3,800. That's just SOME of the 30 15-pound bags of potatoes! and their wives shopped and sorted and delivered, too. Ten of us, plus Ed's family, shopped for toys and clothes. Picture bicycles, Transformers, Pokemon gear, winter sweaters. . .
"I just wanted to say thank you for the Thanksgiving meal and the presents for the kids. We really appreciate it! The kids look forward to unwrapping them! Thanksgiving and grocery shopping is stressful especially when my husband is in Afghanistan! Thank you so much again!" "My husband, father-in-law (Ed) and myself wish you and your family the very best Christmas and that your Thanksgiving is memorable this year. "We cannot thank your husband enough for his service to our country. Without individuals like himself, we would not live in such a great country. Thank you again! "We thank you and your family for your sacrifice while your husband is deployed. If there is anything we can do, do not hesitate to reach out to us. "Many blessings to you and your family." Under the supreme leadership of Ed Koerperich, we carried out our own version of a military mission. We provided 30 families of active military or veterans with an amazing array of holiday food and gifts. This was the main thrust of our $7,000 project ($3,500 from our members and a match from our Rotary District) called the Military and Veterans Appreciation and Support Program. About $1,000 of that is unspent and reserved for financial or family crises that might occur between now and the end of the Rotary year, June 30. 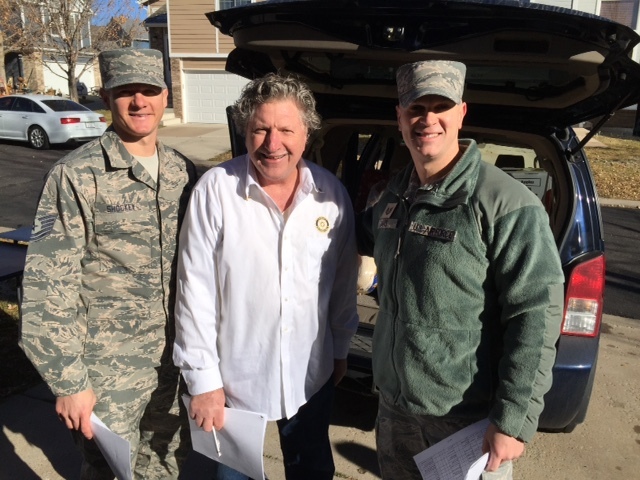 We were aided by members of the North Colorado Springs Rotary and wonderful contacts at the Air Force Academy and Shriever Air Force Base. 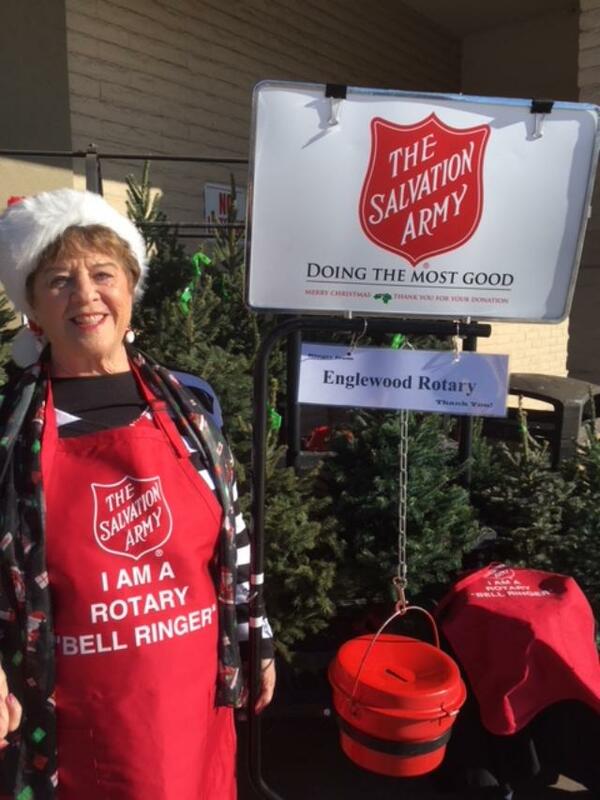 Englewood Rotary is about friendship and service. We excel at both. The club recently enjoyed a wine-tasting organized by our member Ed Koerperich, featuring his talented family and friends who are certified wine experts. The most fun experience of the night was tasting three wines -- semi-cheap, moderate cost and high-priced. We apparently like expensive wine! The wine-tasting fund-raiser brought in $2,000 for our service projects, which include college and trade school scholarships for Englewood students, holiday gifts and food for military families in need, holiday gifts and fun for Head Start preschoolers, and support for the poorest of the poor girls in a small village in Senegal. Englewood Rotary meets three Wednesdays a week for lunch and an enriching speaker. On the fourth Wednesday, we just socialize -- meeting in the evening at restaurant for food, drink and camaraderie. We welcome guests at all our events. Please check our calendar, or contact our president, Patty Burnett, 720-234-6010, paburnett@aol.com. We will honor Dr. Frank Sargent as Englewood Rotarian of the Year at our meeting on Wednesday, Nov. 15. Frank has been a member of our club since 1970, and has helped us help thousands of children and others in our community and around the world. Frank loves all things Rotary, but has a special place in his heart for the preschool kids at the Village for Early Childhood Education in Littleton. In December Englewood Rotary will treat 65 of those kids to holiday lunch, complete with Christmas carols, burgers, hot dogs and cupcakes, and, oh yes, Santa. Frank has championed this project for seventeen years. Each child will receive a huge bag of gifts and winter clothing. Englewood Walmart is an important partner in this project. Employees help select clothes in specific sizes for each of the kids, wrap and through grants help us pay for the overall program. Frank is also a champion of the program we call RYLA -- Rotary Youth Leadership Awards -- in which we send middle school and high school students to fantastic summer camps that teach leadership, team-building and service. Rotary's motto is "Service Above Self." And that's pure Frank! Our top priority for community service is giving scholarships to Englewood students for college or trade school. This year we interviewed more than 20 candidates and had to make some very hard decisions, as all were so wonderful and deserving. We gave six new four-year scholarships at $1,000 a year. We are still funding returning scholars in their second or third year, as well. It's an extraordinary accomplishment for a club of just 30 members. Investments in our foundation plus current-year fund-raising make this possible. Englewood Rotary is featured in the Jan. 12 edition of Your Hub, a local news section of the Denver Post. It's all about our campaign to increase our membership and our ability to do good things in our community and in the world. Where our money goes. . . The Board of Directors recently approved an impressive list of charitable giving for the 2016-17 Rotary year, totaling more than $23,000. At the top of our list, we continue to give scholarships to college or trade schools in the amount of $10,000 or more per year. 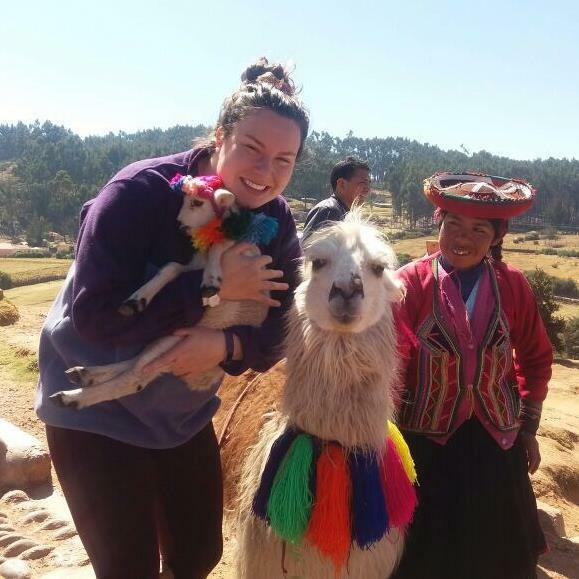 We also will sponsor a senior high recent grad for a year abroad through the Rocky Mountain Rotary Youth Exchange program. Our philanthropy and service projects are heavily focused on children and youth. 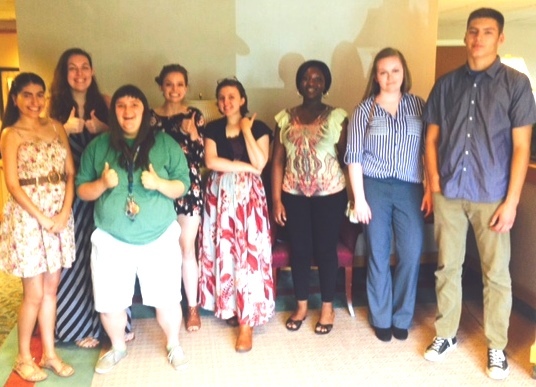 We will spend $1,800 to send four students to the Rotary Youth Leadership Awards camps next summer. Students always report to us, "It was life-changing." Our Four-Way Test Essay Contest touches every elementary school child in grades four, five and six, at a cost of $2,500. Students solve an ethical problem, using Rotary's code of ethics called the Four-Way Test, then write essays. Winners are honored at a lunch and given bookstore gift certificates. Thank you, Vee and John Sabel, Bonita Carson and Dawn Shepherd for buying, packing and delivering these darling backpacks for first graders at Bishop Elementary School. Pretty cute! The Rotary Club of Englewood conducts an ethical learning experience for children in fourth, fifth and sixth grades in Englewood Schools. It is based on Rotary's code of ethics called the Four-Way Test. Children watched a video in which a student saw another student steal a pocketbook. They then were asked what that boy should do, and how he could use the Four-Way Test to solve his dilemma. The Four-Way Test asks these questions: First, is it the truth? Second, is it fair to all concerned? Third, will it build good will and better friendships? And, fourth, will it be beneficial to all concerned.